The 2014 Wastebook Is Here! It’s back! Senator Tom Coburn’s annual compendium of some of the zaniest ways that the U.S. federal government burns through all the money it taxes and borrows in the name of spending: the 2014 Wastebook! Swedish Massages for Rascally Rabbits. ($387,000). Scientists Hope Gambling Monkeys Unlock Secrets of Free Will. ($171,000). Synchronized Swimming for Sea Monkeys. ($307,524). New Bridge Demolished for Using $3,271 Worth of Canadian Steel. ($45,000). FEMA Overlooks Flood Victims, Rebuilds Golf Course Instead. ($202,291). Corporate Welfare for Mega Farmers. ($8,536,052). Airport Tree-Trimming Project Turns into 27-Hole Golf Course Renovation. ($5,000,000). Farmers Get Grant to Produce “Worm Power” Compost. ($199,000). Taxpayers Charged to Promote Hillary Clinton’s $14 Million Book in Europe. ($55,000). 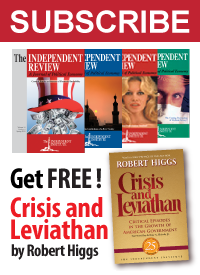 Until then, we encourage you to go through the 2014 Wastebook’s very well researched examples of where Uncle Sam’s team of politicians and bureaucrats makes bad decisions and spent money as if in a drunken stupor. If only there were a federally funded program to send them texts to convince them to not drink ($194,090) so much from the fountain of government spending in the first place! Coburn, Tom. 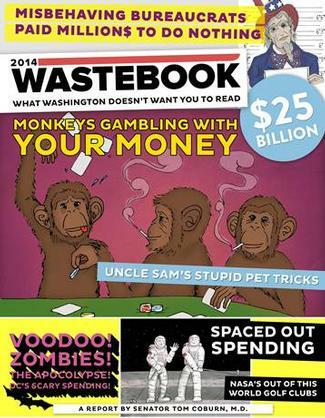 2014 Wastebook: What Washington Doesn’t Want You to Read. 2014 Wastebook. 21 October 2014.